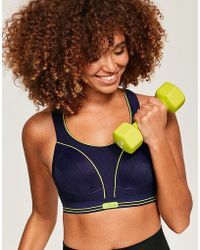 Perfect for the active fashionista, Shock Absorber offers a diverse range of sport and gym-ready products, designed to support you when you need it most. Whether you're running, serving or throwing, only the ball should bounce with Shock Absorber lingerie. This selection of highly researched, practical pieces will fast become your best friend when going about your daily, sporting challenges.